Ocean House 1802 - FREE GOLF, FISHING, DVD RENTALS, WATERVILLE AND ESCAPE ROOM TICKETS! Ocean House 1802 is a two bedroom, two bath newly remodeled condo with gorgeous Gulf-front views on the 8th floor of building 1. • Balcony has a bistro table with four chairs and can be accessed from the living room and master bedroom. • Tile floors throughout unit. • Fully equipped, completely renovated kitchen, dining room table that seats six with two additional bar stools. • Living room has a sofa sleepers and a 32" flat screen TV/DVD/VCR. • Master bedroom has a king size bed with a 26" flat screen TV/DVD. • Maximum of two cars allowed. Guest are required to purchase parking passes from security upon arrival - $20.00 each, limit 2. Cash or check accepted. Great condo. Perfect for a family getaway. Clean, up to date, perfect. Clean, great location, some of the furniture was very worn out. Thank you for your recent stay with us! We are thrilled that you enjoyed it. We appreciate your valuable feedback and hope to see you again soon! Exactly as advertised. We had so much fun and the condo was perfect. The pool was incredible also. The ONLY negative I found was the fact there was only one elevator and it was on the small size too. If you're down there in a not very busy season, there wouldn't be an issue at all. But I found myself waiting for the elevator more than I would like since it was pretty much full when I was there. But other than that ... everything was terrific!!! Addie - Thank you so much for your recent stay! We are thrilled that you enjoyed Ocean House 1802 so much! We appreciate your valuable feedback and look forward to seeing you again soon! Very well kept and great location. Rebecca - Thank you so much for your recent stay at Ocean House 1802! So glad you found it to be well kept and that you were pleased with the great location. We appreciate your valuable feedback and look forward to seeing you again soon! Love staying at Ocean House! This was our first stay in this condo. There is tile throughout which I love! Who likes carpet that holds who knows what?!? Love the updated kitchen and granite. The kitchen was nicely stocked even though we only had breakfast & lunch there. Each bathroom had four bath towels each which was very nice! Linens were pretty good quality. This condo had a coded lock which meant we did not have to keep up with keys! Awesome! Would like to stay here again!! Jean - Thank you so much for your recent stay! We are so glad you liked the tile and found the kitchen to be everything you wanted. So excited that you gave Ocean House a try and that you loved it!! We appreciate your valuable feedback and look forward to seeing you again soon! We love ocean house 1802. Very clean and updated. This was our second stay. 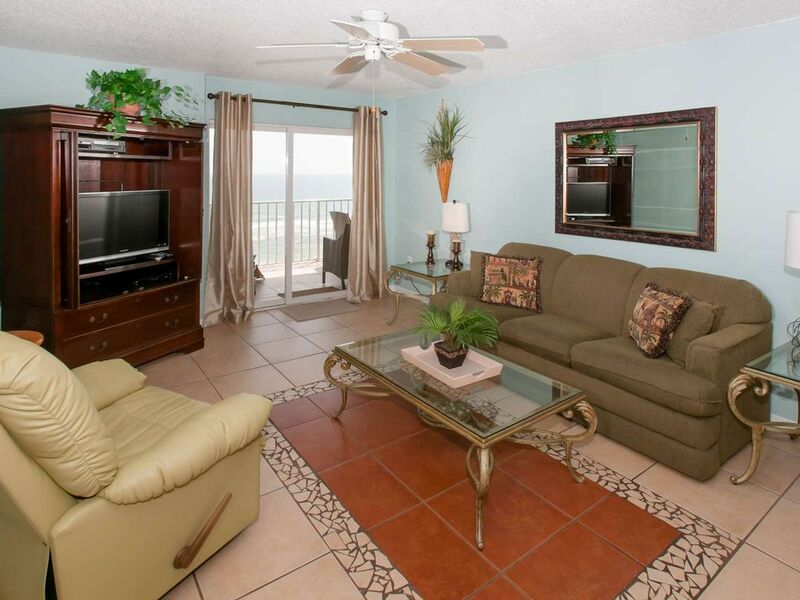 We love the large oceanfront balcony with doors going out of living room and master bedroom. Steps away from the beach. Large pool. Best of both , beach front views from living room and master bedroom with bay views across the street. Barbara - Thank you so much for your recent stay! We are so glad you can back and enjoyed it yet again! That property does indeed offer pretty much the very best of everything! We appreciate your valuable feedback and look forward to having you again! !